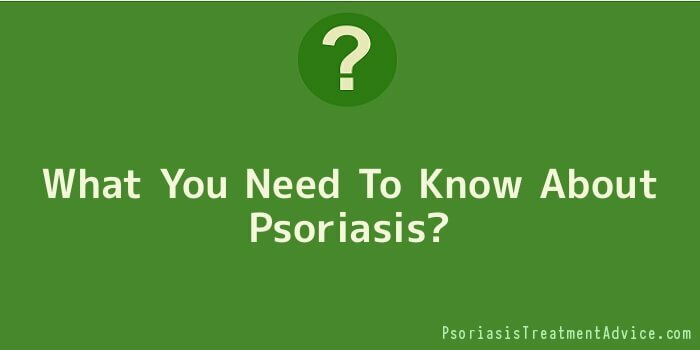 What You Need To Know About Psoriasis? Your skin starts turning colour and becomes very itchy you wonder what is happening. You realize that your toenails are turning yellowish and some of them even seem to be detaching from the base of the toes. Your fingernails have a not so normal colour. You develop very dry hard skin on one area that looks like some it’s growing by the day. Well what you are suffering from is a condition called Psoriasis. Psoriasis comes in different forms and affects different parts of the body. It is a condition that cannot be cured but can be managed with proper care. It involves the overproduction of body cells on an area therefore causing growths on the skin. It is believed that it has to do with an ineffective immune system. An immune system that is not able to control its functions is to blame for this rare lifelong skin condition. Families that have Psoriasis running somewhere in their lineage is at a higher risk of passing this to their children through their genes. Those who suffer from this condition often are emotionally stressed and this could lead to low self esteem especially if the affected part is visible to other people. You can tell you have Psoriasis if your skin suddenly starts changing and becomes itchy. This varies from person to person. The skin can become red or pink and even have some pus in it. It is however not contagious, you cannot acquire this disease by mere touch, not even that pus can contaminate you enough to catch the disease. Psoriasis can cause swelling of body joints due to inflammation and this can be very painful. In some cases it even causes Arthritis. This kind of Arthritis is called Psoriasis Arthritis. Medication is available to deal with the effects of Psoriasis and therefore affected people need not worry but seek medical advice. It is also important that the affected know how to take care of their skin so as to avoid aggravation of the problem. Seeking medical advice is the first step towards better health and less irritation of Psoriasis. Psoriasis can be very uncomfortable especially when it attacks sensitive parts like the underarms and the buttock area. Skin care can ease irritations and even improve the condition. Although Psoriasis cannot be cured, there are measures that once put into place can improve and reduce the patches and scales making them less irritable. For example keeping your skin moist and eating balanced diets can play a great role in improving them. Taking drugs prescribed by a health practitioner is also advised in dealing with this. Depending on the different stages the condition is at, different drugs and therapies are offered. In conclusion, those suffering from Psoriasis should not shy away from getting medical help and should accept their situations by taking good care of their skins and bodies in general. At least this way its effects can be minimized to manageable levels.